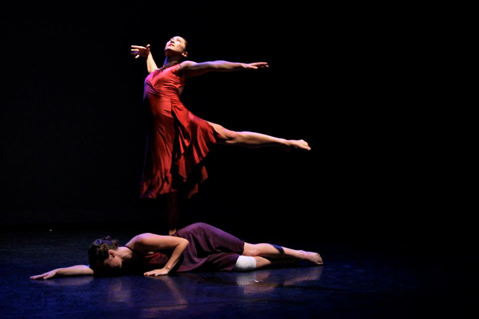 <b>THE FALL:</b> Meghan Morelli appears in Nebula Dance Lab's latest work, Floodlit & Fallen. Devyn Duex has big visions. Since founding Nebula Dance Lab in 2010, the mother of two with a full-time day job has also poured full-time creative energy into her performing arts nonprofit. As director, choreographer, and dancer, Duex plays many roles for Nebula, and still finds time to dream up new ventures. The latest of these is Floodlit & Fallen, an evening-length performance at Center Stage Theater taking place October 10-13, featuring seven professional dancers, original costumes, lighting, text, and music. On the program for this weekend are two group works: a reprise of Duex’s “Sand Into Glass,” which premiered in 2008 and explores the idea of challenge as a formative force, and “Floodlit & Fallen,” an ambitious new multimedia work by Santa Barbara native Brooklyn Hughes, who’s back in town after earning an MFA in choreography at the University of Arizona. Duex described Hughes’s work as a “fairy tale come to life” and noted that the emphasis on ballet technique has brought out the best in her dancers. In addition to rehearsing for this show, the company has also spent the past year teaching classes through their education outreach program, touring works to dance festivals in Los Angeles and San Diego and planning “Dance for Mobility,” a service trip to Chile in 2014, during which they will perform and teach classes in partnership with the humanitarian organization Free Wheelchair Mission. When Duex named her new company, she chose the word “Nebula” to emphasize the vast scope of her project and the drawing together of disparate energies. True to that vision, the company is now in the early stages of planning for a dedicated training space focused on contemporary dance technique. Ever since the closing of the Dance Warehouse more than 15 years ago, Santa Barbara has lacked a studio devoted to modern dance, and Duex wants to fill that gap. In the meantime, she’s focused on showing work and raising funds; Nebula’s annual gala fundraiser and celebration is scheduled for November. To learn more about the company, visit nebuladance.org. For tickets to this weekend’s show, call (805) 963-0408 or visit centerstagetheater.org.